Real me is all set to launch its Realme 2 after a huge success of its first smartphone Real me 1, Real me is a sub-brand of Oppo Chinese Manufacturer. But before the launch of Real me 2 all specifications has been leaked online. As per the leaked information, the handset is expected to come with 6.2-inch display with a resolution of 720 x 1520 and a 19:9 aspect ratio. Real me is offering Real me 2 in two varient of 3GB and 4GB . The smartphone will be powered by a snapdragon 450 chip . The handset supports internal storage upto 64 GB,further which can be expanded upto 256 GB. Smartphone comes with dual-camera on the back with “AI Beautification 2.0” and a Bokeh mode.Front it has 8MP sensor lies and rear it has 13MP+2MP dual camera. Handset is coming with fingerprint scanner which is added in this device, missing in Real me 1, along with this it contains a facial unlock system. Device comes with Dual-sim support with dual VoLTE support with, 4,320 massive battery backup. 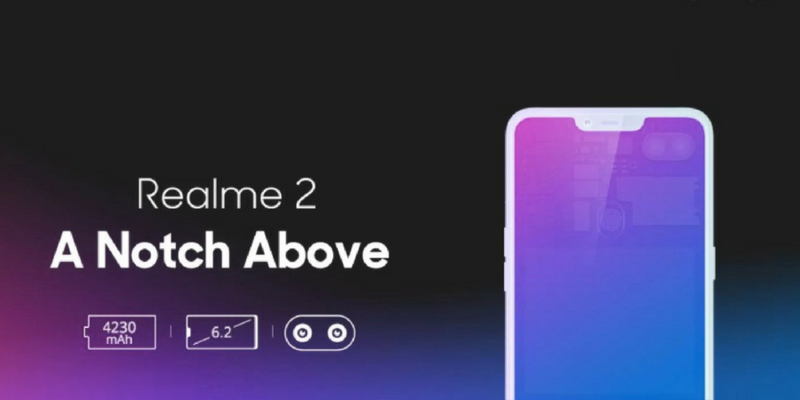 Real me 2 is the first phone in smartphone world which is providing Notch under Rs. 10,000. I like the helpful information you supply for your articles. I will bookmark your weblog and check once more here frequently. I’m rather sure I will be told a lot of new stuff proper right here! Good luck for the following!